Started playing Bass Guitar at the age of 16. A self-taught musician, performed first professional show at the age of 18 with older brother Miki L’s Blues Band. During this time they opened up for several signed Blues artists such as Bobby Rush, Lefty Diz , Denise LaSalle. Ajay's first recording experience was with Blues artist Milwaukee Slim on Blue Moon Records. Ajay played Bass Guitar on several tracks on the album titled “Lemmon Avenue.” under stage name Junior M. Later he started venturing off into different genres of music and joined several local original Music only bands in the Twin Cities Banther, Shagg , Curbfeelers , Red Veda, Fresh water etc. He performed locally as well traveled to other States to perform original Music in front of record label reps in hopes of a record contract. Ajay also joined local Gospel groups and opened up for Shirley Murdock and was Bass player for Ann Nesby for one gospel concert in Minneapolis. Ajay has played Bass Guitar for 18yrs for several Praise teams at different Churches in Minneapolis and St. Paul area and is currently still playing weekly at Church every Sunday in the Minneapolis Twin Cities area. 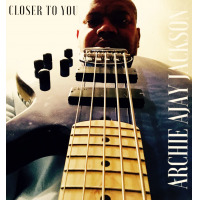 Tracked Bass Guitar on several local Gospel Artists CD's and has written several Bass Guitar Instrumental Smooth Jazz CD's. Currently working on his 5th Bass Guitar instrumental CD. All About Jazz musician pages are maintained by musicians, publicists and trusted members like you. Interested? Tell us why you would like to improve the Archie Ajay Jackson musician page.